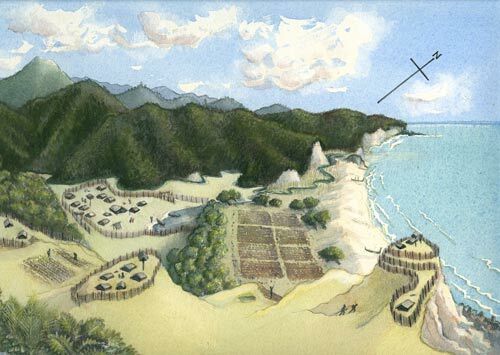 This is an artist's impression of a typical Māori settlement or kāinga. Fixed settlements were located close to important resources. Fishing, including eeling and whitebaiting, and collecting shellfish meant Māori settled near waterways: the sea, lakes, swamps, rivers and streams. In areas where Polynesian horticulture was viable, north-facing sloping land was sought for growing kūmara, taro and hue (bottle gourds). Around the 1500s fortified pā became important and were often located on high, inaccessible sites.